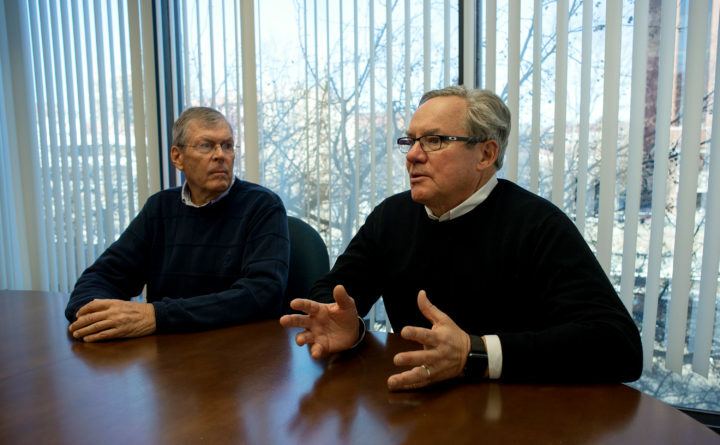 James Newton (right), owner and executive chairman of the board of Horizon Solutions, and John Bragg, chairman of the board for N.H. Bragg, announced the sale of N.H. Bragg to Horizon Solutions at the Bangor Daily News on Thursday. N.H. Bragg and Sons, a mainstay of the Bangor economy for 164 years that’s in its sixth generation of family ownership, will be sold to a company based in Rochester, New York, at the start of 2019, the company’s chairman said Thursday. The distributor of industrial products and services to customers such as the Bangor Public Works Department, Cianbro, Old Town Canoe and Brewer automotive parts manufacturer Somic America started in Bangor as a supplier to local blacksmiths. It will stay in Bangor and retain its name, employees and clients when the sale to Horizon Solutions becomes official Jan. 1, according to Chairman of the Board John Bragg. 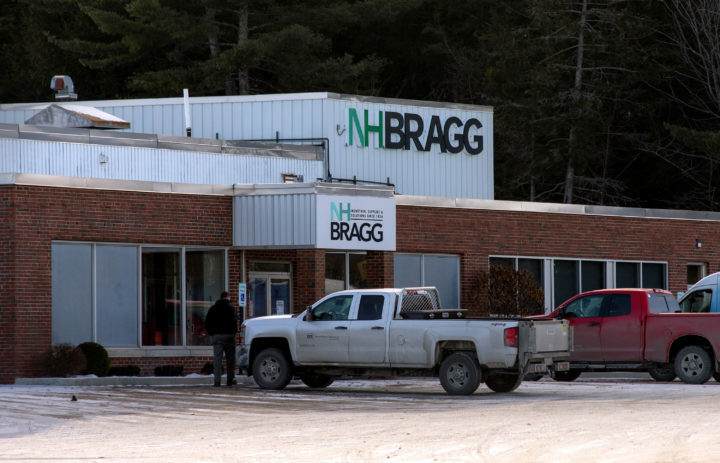 N.H. Bragg has approximately 60 employees who work at its three branches in Bangor, Scarborough and Tewksbury, Massachusetts. It provides a wide range of products, including cutting tools and abrasives, hand tools, power tools, fasteners, and safety equipment including clothing, gloves and breathing masks. As a distributor of electrical and safety products to industrial customers, Horizon Solutions has served many of the same clients as N.H. Bragg in different parts of the Northeast for years. Horizon Solutions is the product of a 2000 merger of three family-owned businesses, including one that was based in Portland. Bragg said that selling the company was inevitable in order to sustain and grow the business. In looking for a buyer, he said he sought out a larger company with similar ideals. He found a good fit with Horizon Solutions, he said. “We’re aligning ourselves with someone that’s significantly larger and therefore able to invest in technology,” Bragg said. “We have known these people for years. It still feels like family. Horizon Solutions has more than 200 employees spread among multiple branches in New England and New York. “When the opportunity came to kind of chat about what a future together might look like, it just seemed like a natural fit right from the beginning,” said Jim Newton, one of the owners of Horizon Solutions. 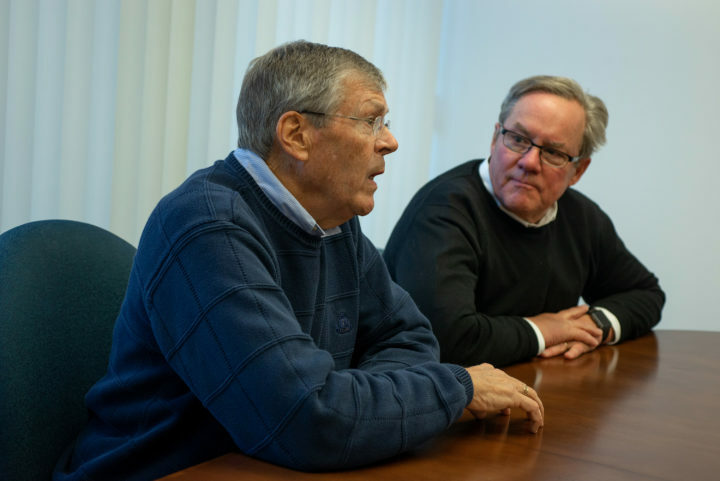 John Bragg, chairman of the board for N.H. Bragg, and James Newton (right), owner and executive chairman of the board of Horizon Solutions, announced the sale of N.H. Bragg to Horizon Solutions at the Bangor Daily News on Thursday. In 1854, Norris Hubbard Bragg and Sumner Basford started the company presently known as N.H. Bragg as a supplier to local blacksmiths. Its business has been changing to incorporate new products and services throughout the decades. The company supplied auto parts for most of the 20th century and started supplying welding cylinders in the 1950s as blacksmiths started using new technology. N.H. Bragg sold off its welding division in 2008. The company opened its Scarborough branch 25 years ago and its Tewksbury operation last year. For financial purposes, the transaction between N.H. Bragg and Horizon is a sale, but it will function more as a merger since Bragg family members will be closely involved with the new company, Newton and Bragg said. Current N.H. Bragg president Jon Eames, Bragg’s cousin, will become vice president of Horizon’s industrial and safety supply division. The N.H. Bragg building on Perry Road in Bangor will remain under Bragg family ownership, and Horizon signed a long-term lease, which Bragg said shows Horizon’s commitment to keep the business in Bangor. Horizon Solutions has had an office in Bangor with a dozen employees for nearly 30 years. Those employees will move into the N.H. Bragg building. Since both companies have offices in Scarborough, those offices will merge, and N.H. Bragg’s Tewksbury branch will remain an independent location, according to Newton. Two of the three businesses that merged to form Horizon Solutions specialized in electrical products, and one supplied both electrical and industrial products. With N.H. Bragg’s addition to Horizon, Newton said, a broader inventory of products will be available to both companies’ clients. “There are some things that we can do today that we’ve never been able to do separately,” Newton said. N.H. Bragg is the oldest member of the Bangor Region Chamber of Commerce.